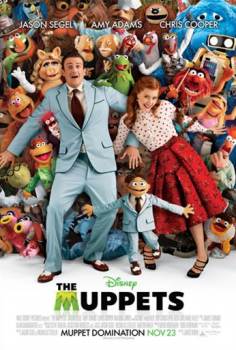 Enter to Win a Disney The Muppets Autographed Movie Poster! Are you a Muppets fan? Do you like Amy Adams? If so, you'll love this giveaway! One lucky person will win an autographed poster signed by the cast of Disney's new movie, The Muppets! Poster is signed by: Jason Segel, Amy Adams, Director James Bobin, Kermit, Miss Piggy and Walter! A big thanks to Disney for providing this great prize, and to Deals4Dummies for inviting me to participate! GOOD LUCK everyone! My favorite Muppet would have to be Kermit, because I love his kind, easygoing personality and optimistic outlook on life, and like him, I often find myself the center of sanity in my crazy family and circle of friends! My favorite Muppet will always be Animal. He's wild, and he plays the drums! My favorite Muppet is Miss Piggy because she hits people.